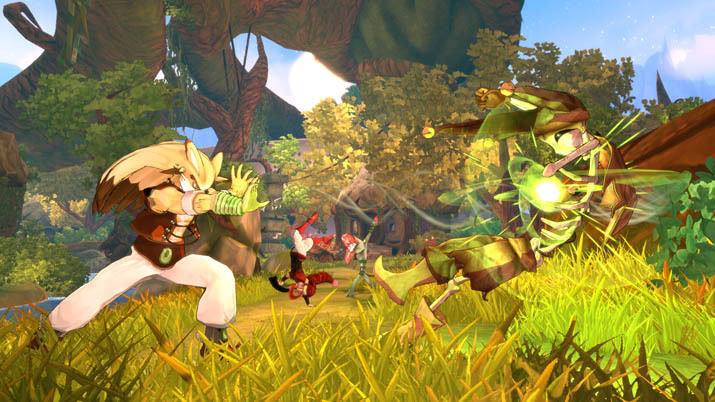 Another beautiful production Made in France, from development studio Enigami, Shiness: The Lightning Kingdom (STLK) is a flawed albeit delightful JRPG that unoriginally opens up with you, the hero, stranded on an island because your ship has crashed. In this opening stage, you are to find a fellow named Waki, which turns out to be a furry anthropomorphic creature, as are nearly half the characters you’ll encounter. The tale picks up from there and don't say you haven't be warned: STLK’s story is a prominent one, with cutscenes in the plenty. The premise is straightforward, and one you've heard many times before. There exists a conflict spanning across kingdoms, and there are villainous, nefarious characters responsible for the spread of an evil element, the Dark Shi in this case, which plagues the otherwise peace-driven, beautiful world. The initial area is especially: the island, although small, is dense, rich, and replete with places to explore. Explore the entire area, as the completionist in you naturally should, and some chests will provide useful items to get you up and running with a healthy dose of accessories. You'll then be more than prepared to tackle the boss, who resides within the Gromiz Lair, and once you put an end to his existence a passageway once blocked opens up, allowing you to continue your adventure onto new territories. Do it right, and it will take a few hours to reach this point. STLK isn't a game developed to rush through, and the experience will lose its value when you do. Central to STLK are puzzles, and what takes time to complete them, as the word puzzle naturally entails, is figuring out what to do. Yet once you do, you’ll find STLK’s to be quite short. With some, for example, you’ll have to search your surroundings for all the relevant pieces, often within your line of sight. Interestingly enough is that the more characters you have in your party, the more access you have to different ways to solve a puzzle. Being plentiful in characters increases the number of approaches you can take, but also the number of puzzles you can solve. One character can place or throw stones he summons, for example, while another uses telekinesis and manipulates objects–either moving something into place or removing an object in the way. It's a smart approach to making you stop and think, but without forcing an excessive amount of time away from action and story-telling. This isn't to say that, in terms of presentation, some improvements couldn't be made. Menus providing character information, for example, are overwhelming at first, even if their features will remain incomplete until you reach your camp. The map, at times, is difficult to read and understand. I often found myself lost in navigating objectives, and looking at it didn’t help. 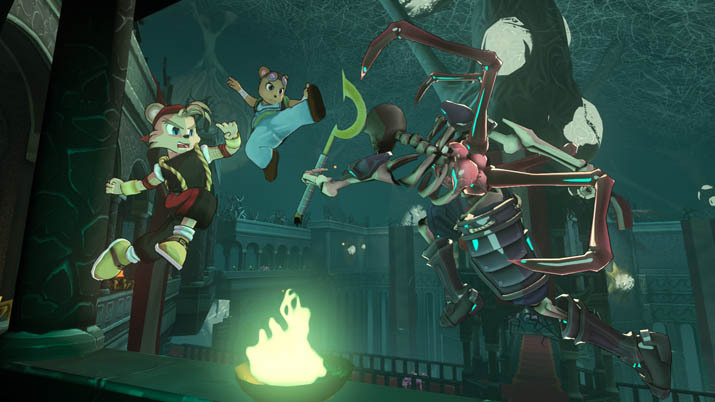 On your characters' equipment panels, you select melee and ranged disciplines: as you expect, the former is for close-quarter tactical purposes, such as knocking your opponent back with a powerful blow; the latter casts spells using abilities known as Shi, or the equivalent of mana-generating powers and come in four different types, one for each element. It's a system that's not only well designed, it also allows for greater customization in fighting, as your first spells may only pull from one elemental pool but later ones will use a combination of two. Also noteworthy is that Shi points are distributed toward each element, and will not regenerate on their own. Instead, you must proactively hold down a button, which makes your characters concentrate and replenish his pool. In your quest for adventure, learning disciplines is front and center and you'll do so in a variety of ways. As enemy drops, from a merchant, within a chest. As you organically progress. Some disciplines will merely modify your stats, while others will teach you spells and melee-based attacks you are to master overtime. Once you've become an expert at one, then you'll rejoice in finding out that it no longer needs to be equipped, and playing with it revealed another feature STLK has implemented to allow some variety in combat through customization. Stats increase according to a preset progression scale when characters level, without skill points to spend and attribute toward statistics or talent trees. Instead, you'll unlock skills and skills only, with the only limitation being that when you learn a new discipline, some of your characters won’t be able to pick it up because of their preferred fighting style. Battles are one-on-one encounters and require planning and careful timing, but also the ability to button-mash your controller quickly. Combos enemies send your way are quick and relentless. A lock-on feature is there for you to better engage, but the characters move slower once you do. It's a disappointing effect, frankly, and I much more enjoyed keeping it off and instead rolling across screens to avoid incoming blows.Catching up to an enemy trying to cast multiple spells is also fun, aside from the fact that the camera is clumsy and, consequently, annoying. At times you'll find the angle erratically shoots up to the sky; at others, the enemy will be unnaturally hidden behind some rocks along the edge of the battle ring. A solution, I guess, exists: you can reactivate the lock-on to recalibrate, and the camera will focus anew on to the targeted foe, but bear in mind: this simple button press interrupts your otherwise flawless and seamless combo, causing you to lose the upper-hand. Sadly, the glitches go beyond fighting and into exploring STLK’s universe. 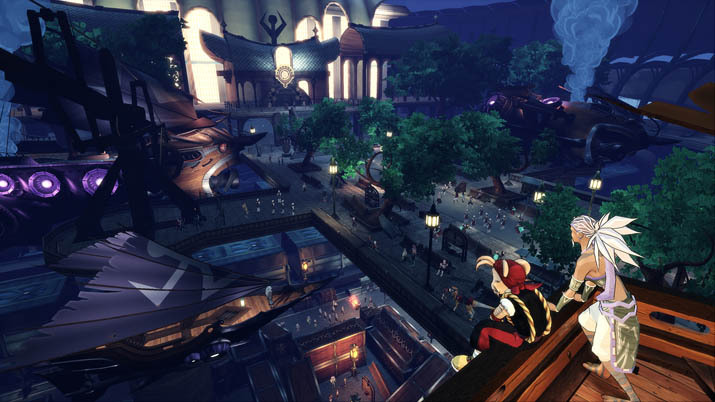 You'll witness characters floating alongside rope railings, usually when you get too close to them. Switching characters rectifies the issue outside of a fight; but during a battle, you just have to wait until your opponent attacks you, and that’s as frustrating as it’s unfair. Despite glitches in the system, STLK’s combat proves to be fun and one of the most enjoyable aspects of the game. Proper timing in casting spells, when there is an adequate amount of distance between yourself and the mob, is key to successful fighting. Otherwise, you’ll find the hard way that your opponents close their distance and subsequently strike at you with a combo, while your sorry self is in the process of attempting to cast your spells. Melee fighters have it easier comes defense, as they can cancel attacks in favor for a well-timed parry. That means you'll find them able to dodge rather easily, but trickier opponents will also have totems set up to cast secondary spells. So be prepared to face numerous threats, and at a fast pace. Although it’s easy to grow annoyed when an enemy performs a combo that you cannot escape, the challenge, combined with speedy battling welcomingly brings mechanics from classics such as Soul Calibur and Mortal Kombat. Combat is also difficult enough at first, although that drops after several characters have joined your party. That's because allies who aren’t directly engaged in combat heal you whenever your health drops, given, of course, that your enemy hasn't squeezed in a powerful combo that wholly decimated your health. Plus, you can tag in a character whenever you need to avoid the enemy killing off another. What more could the student player demand? Despite clumsy camera work and few bugs along the way, Shiness: The Lightness Being is a delight to play. Colorful and enchanting, it’s a role-playing game that offers an engaging story with numerous cut-scenes and a combat system you’ll find entertainingly challenging. If you’re a fan of action-driven RPGs and can enjoy a good tale, and are the forgiving type comes fluidity and smoothness in gameplay, then consider the purchase.